Yesterday, ProPublica reported that voters were posting photos of their ballots on Instagram, the photo-sharing website owned by Facebook. As it turns out, this may violate the law in several states, which, to discourage people from selling their votes, prohibit showing your ballot to others. 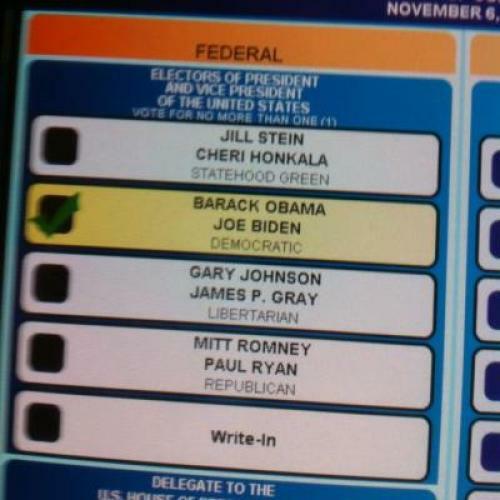 (The picture supposedly offers proof of having voted as promised.) On the other hand, in light of new technologies that make ballot-sharing as easy as snapping a cell phone picture, at least one state, Maine, repealed its prohibition on showing your ballot last year. Regardless of its legal status, social media has enabled ballot-sharing in an unprecedented way, and far from bringing us together, the end of the secret ballot threatens to segment and divide us. What’s the source of the impulse to publicize your ballot? On one level, it seems to reflect a culture of “pics or it didn’t happen”—the notion that nothing can be believed unless it’s captured in digital image. But more broadly, the impulse reflects a culture where people advertise their every thought—including those that used to be regarded as intensely private. Journalists used to keep their votes private to preserve their credibility as neutral observers; in this election, by contrast, Slate asked its contributors to reveal how they voted and why. The essays that resulted were no more insightful or surprising than asking the first ten names in the phone book to explain their votes. “I’m voting for Barack Obama because I want to live in a country with more opportunity and greater equality,” read a typical contribution. Of course, it’s appropriate for citizens to share the fact that they participated in a democratic election. People around the world were inspired by photographs of anonymous voters showing ink on their forefingers to prove they’d voted in the Iraqi election of 2005 or the Iranian election of 2009. In the same spirit, many Americans wear “I voted” stickers, or the digital equivalent: a Facebook post that, using GPS, announces one’s voting location. But broadcasting the candidates—and ballot initiatives—for whom you voted is another matter: It is part of a broader collapse of impartial authority when it comes to voting. We’ve seen this outside of presidential elections, among juries rather than in the ballot box. For centuries, jury verdicts were anonymous to preserve the impression that jurors were a proxy for the voice of God. In the 1990s, by contrast, jurors in celebrity trials began talking to the press and getting book deals as a result. More recently, jurors are tweeting and Facebooking during deliberations, resulting in judicial sanctions and sometimes mistrials. Social media is encouraging the collapse of the boundaries that have traditionally protected serious deliberation, and the consequences are not yet clear. In some instances, there will be professional ramifications. Not long ago, a man lost his job as deputy sheriff of Hampton, VA, for liking on Facebook a candidate running against his boss, the sheriff. The man sued, arguing that liking a candidate on Facebook is a First Amendment right. A court rejected the claim. It remains to be seen whether voters will be penalized for snapping pics of their ballots yesterday. More generally, if ballot-posting were to become a new norm, those who keep their ballots secret would create the impression that they had something to hide. As the Supreme Court has recognized, the framers of the Constitution thought that anonymity was crucial to democratic participation—including the freedom to take unpopular positions without fear of retribution. With the end of the secret ballot, that freedom would be imperiled. Are there upsides to the new transparency? If the end of the secret ballot becomes a new norm, it would have the unanticipated benefit of putting exit pollsters out of business. People who post their ballots are probably already inclined to be open with their political views, and perhaps revealing the details of their votes on a series of questions would help them organize better politically. The end of the secret ballot would also provide another metric for number-crunchers like Nate Silver, whose data-driven algorithm was so dramatically vindicated last night. But over-sharing personal information is ultimately a recipe for division rather than shared democratic participation, and it threatens to fragment our civic culture. On election day, we don’t really need to know that our neighbor, our teacher, or our favorite journalist voted yes on one initiative and no on another. The point is that we all voted. Knowing how and why makes it harder for us to interact as citizens on common ground.